The Oscar-nominated song rules the Billboard Hot 100 for a tenth week, becoming the longest-running #1 hit since, well, another song that featured Pharrell: Robin Thicke‘s “Blurred Lines,” which spent 12 weeks on top last year. Billboard notes that of the 1,034 songs which have topped the Hot 100 chart since its inception, only 28 songs have spent 10 weeks or more on top, and “Happy” is one of them. But “Happy” is only the third #1 hit by a solo male artist to have spent that long on top. The other two are Elton John‘s “Candle in the Wind 1997,” which was #1 for 14 weeks, and Eminem‘s “Lose Yourself,” which was #1 for 12. 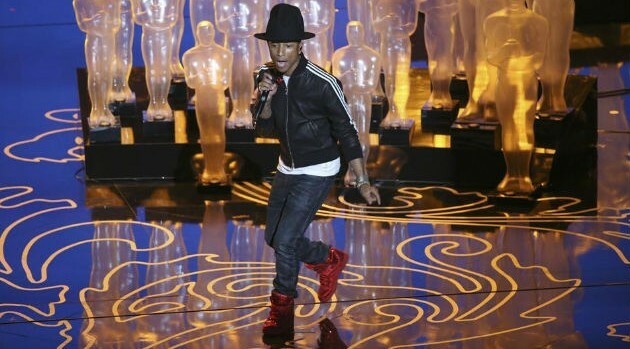 However, Pharrell’s streak can’t last forever. Billboard reports that based on radio airplay, John Legend‘s “All of Me,” which has been patiently waiting at #2 for six weeks, may finally overtake “Happy” next week.